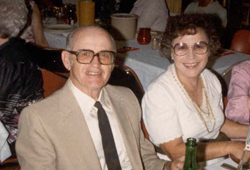 Shortly after the death of her beloved husband, Matthew, Lovina established a charitable gift annuity to ultimately supplement their Matthew C. and Lovina S. Resick Endowed Scholarship program. This is a wonderful tribute to both Matthew and their long support of the athletic programs at Ashland University! Matthew and Lovina were college sweethearts, and of course met at A.U.